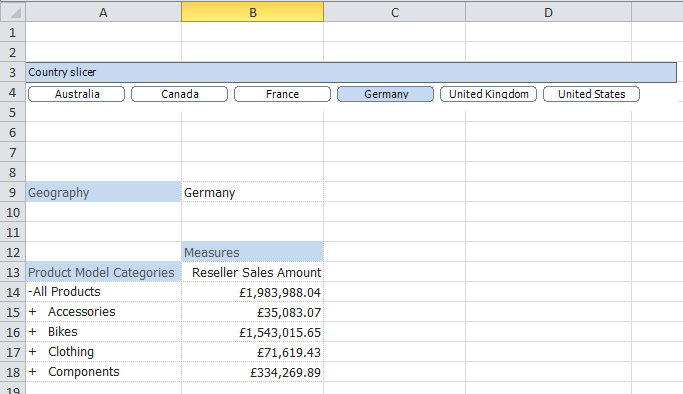 This is a simple report with Geography on headers and Product Model Categories on rows showing Reseller Sales Amount with the Country slicer driving the grid. The slicer is set to update cell B9 with the slicer choice. So I show this to my manager and he asks for some more detail – he wants to know what type of businesses there are in each country, their names and the number of employees. 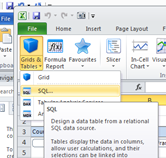 That’s when I realise that all of this extra information is not in my cube but on a completely separate SQL table. Not a problem for XLCubed! 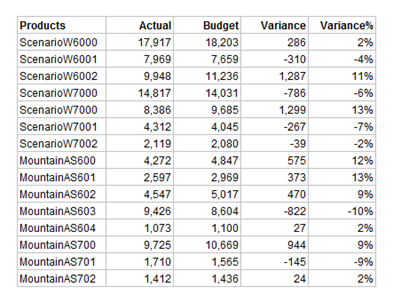 I can quickly create a report that includes all this data from the SQL table. 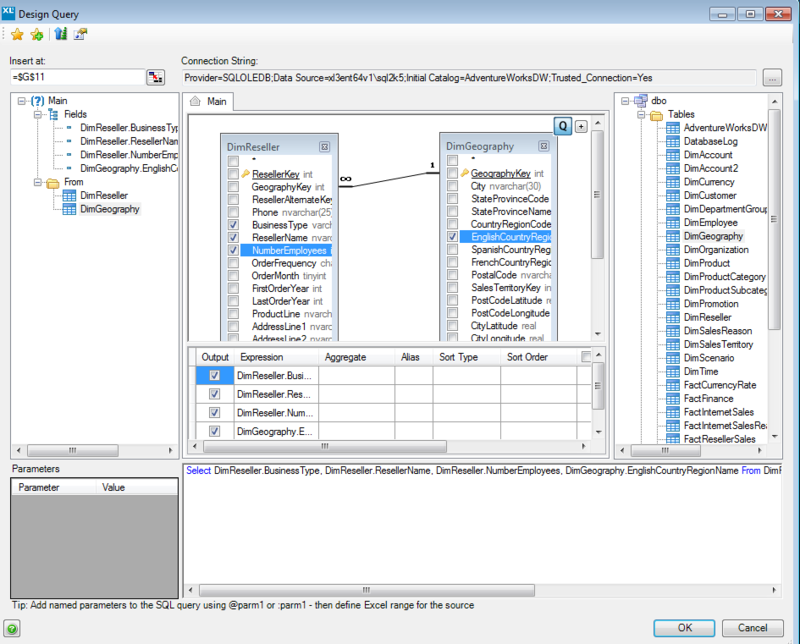 Using the SQL option within Grids & Tables I can create a report that connects to a relational SQL data source. 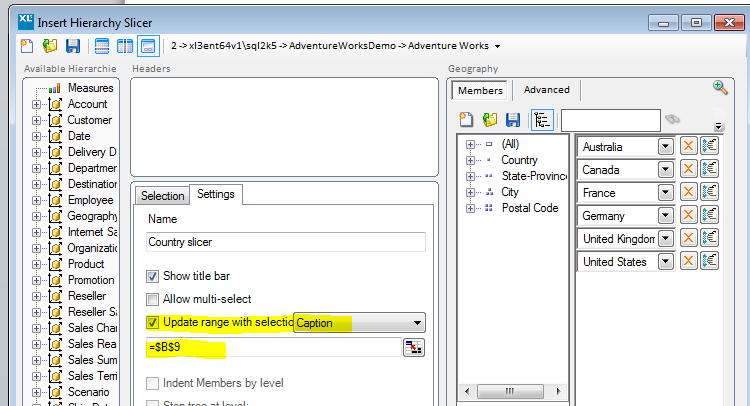 Let’s build up my SQL query – I’m using the DimReseller and DimGeography tables to return the required fields. This is great but it returns data for all the countries and I only want to see data for the country chosen through the slicer. So let’s add a parameter to our SQL query. 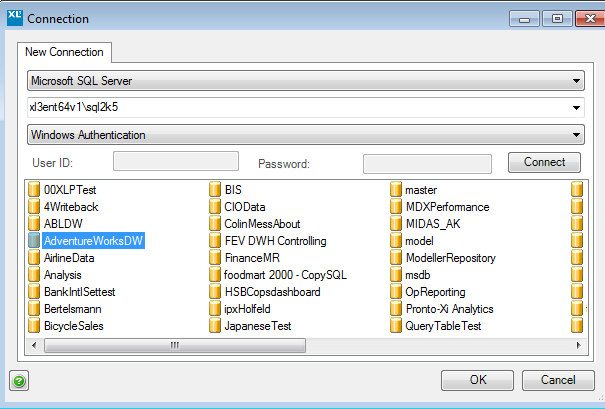 If you look at the corner of the SQL query window you will see the parameters area – with a very helpful tip on adding a named parameter. 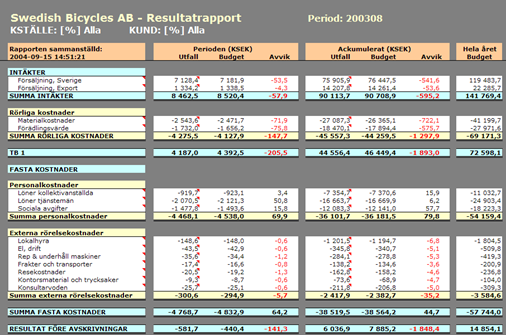 Now we can define where the Excel range is for our parameter – in our example it is cell B9. You remember that this is the cell that the slicer has been set up to output the slicer choice. So now when we select a country from our slicer eg United States the grid refreshes as well as the table. An interesting optical illusion is the so-called Hermann Grid illusion: the effect of seeing gray dots at the intersections of a black grid on a white background or a white grid on a black background. 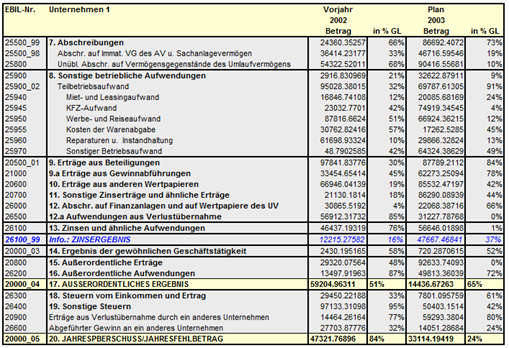 Tables formatted with medium or thick black or gray borders tend to produce Hermann Grids. Just scan the table above and you should see the gray dots in the grid intersections. 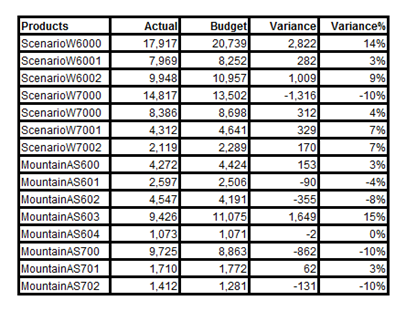 Above is the same table with light gray borders. This eliminates the Hermann Grid illusion and – by de-emphasizing the grid – puts more emphasis on the numbers. So I hope you are with me – get rid of the heavy grids and free your data! Most reports are based on combinations of tabular layouts, so to continue my series about visual design (see my previous post) I will focus on the most common and simple problem to fix: The fundamentals of how to align numbers and text in tables and how to treat their headings. Right-align a block or column of whole numbers or of whole numbers and text. Left-align a block or column of whole text. Align numbers at the decimal point (or imaginary decimal point). All those habits make the table more difficult to read. To understand why this is the case let’s use the Gestalt Law of Proximity. This is exactly what happens if you left align column headers on numerical columns: As shown below and the brain does not associate them anymore which is what I want in most cases for headings and numbers. So Excel Defaults are not right as shown below. Right aligning the headers brings them together. ….what can be explained by the Gestalt law of Closure. Hence we perceive the columns of numbers and headers still as a unit even though the headers are placed somewhat apart from the figures. If we now disable the Excel grid lines we end up with table which merely relies upon white space and Gestalt laws to format the table providing clear associations: A first class table. In western cultures we read text from left to right so it makes a lot of sense to left align text columns but not so for numeric columns. The eye has to search for the decimal point to get to the ten, hundred or thousand digit, this makes comparing numbers quite difficult if not impossible when many numbers are involved. Here the Gestalt Law of Continuity can help, simply right aligning brings all tens, hundred, thousand digits on the same virtual line and makes comparison straightforward and simple. Unsurprisingly, centering numbers in column causes exactly the same problem as shown below. Another visualization “No No”. Right or center alignment leads to severe difficulty comparing values of the same period in different rows in the table. If the sparklines have the same amount of data points this is not an issue but in dynamic reports this may not always be the case so its better to be safe than sorry. I hope that this article has been useful and I look forward to dealing with other visualization techniques in later posts.